Eclectic international then, you say to yourself, mentally agreeing that the natural successor to nouvelle cuisine has rapidly disintegrated to a kedgeree of whatever the kitchen can’t get rid of soon enough. So, steamed fish with tamarind sauce does justice to neither western nor Indian cooking, but simply tastes foul. I’m Chef Niemeier’s guest at La Rochelle at The Oberoi New Delhi, where a constantly revamped menu has replaced the white-gloved service of yore. For appetizers, there’s Asian marinated duck ravioli with shallot compote and citrus tomatillo sauce. The bland ravioli marries perfectly with the stronger flavour of the duck, just as the less than exciting shallot compote tingles on the tastebuds with the tart sauce. Tres formal service has metamorphosed into tres exciting cuisine: you never know what the chef is going to serve up every two weeks. 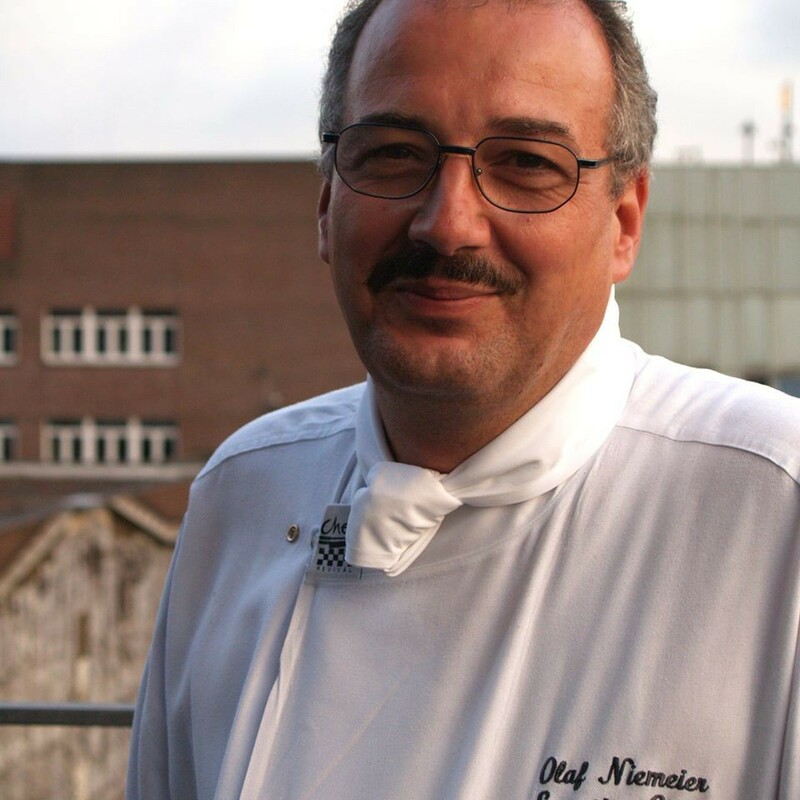 Chef Niemeier’s signature is the surprising combinations of ingredients he uses. “My rule of thumb is that it has to fit together and look and taste good.” Ricotta cheese and potatoes, for instance. What gives it a lift is the sauce that does double duty as a garnish: piquant lime combined with coconut. Again the backdrop of the main ingredients is the vivid yellow sauce with flecks of red (peppers) and black (olives) – satisfactory whether you’re an artist or a gourmet. “There are rules to be followed,” says the chef of his craft. “You don’t mess with classic dishes for one thing. And if you do re-work one, for whatever reason, you have to clearly state this in the menu.” Perhaps that explains the number of times the word ‘style’ crops up on La Rochelle’s menus. Calling a dish Boeuf Bourguinone when it’s an adaptation is heresy, but call it Boeuf Bourguinone-style and you can substantially re-work it. “But why talk of beef at all?” objects Chef Neimeier. “We’re in a country where beef, by and large, is not eaten. Neither, for whatever reason, is pork. Or hare, or venison for that matter. Don’t put these meats all over your menu and then complain that Indians are not adventurous because your 200-cover restaurant runs empty. Of course it will be empty! Did you expect that because a French chef gets a two year contract in India, 900 million people will change their dietary habits?” His barbed reference is to a competitor hotel and its chef. On the other hand, La Rochelle’s menu symbolizes Niemeier’s philosophy that to keep the customers rolling in, it has to reflect local sensibilities. Not only are beef and pork virtually absent, there’s even a separate vegetarian menu as exciting as its non-vegetarian counterpart. Certainly, kohlrabi lasagna with smoked mozzarella in beetroot sauce and ricotta cheese with grilled leeks with cumin mango sauce doesn’t sound like standard ghas phoos fare. Neither does the chef allow his passion to run unchecked over the hotel. Each of the speciality restaurants has food from the region it represents – no experimentation there. Niemeier’s touch is apparent only in La Rochelle which he says is more continental than French. His inspiration is the food markets of Delhi, including the wholesale spice bazaar in the deep bowels of Old Delhi, and the net which he surfs for ideas. He would have us believe that this sort of fusion cisine (oops) is being done all over the world, each chef presenting his version.